We were broke. It was Obvious. And people wanted to help. Has anyone ever gotten a call from eBay? And that's how I know I can teach anyone a thing or two about how amazing the art of 'crowd funding' can be. The phone call went something like this, "Hi, Kristen. This is so and so from eBay. We're just wondering how you plan to fulfill these orders for tanks of gas and what exactly you're auctioning them off for? We're not sure it meets eBays compliance standards." Antigone Rising was about ten thousand dollars into what turned out to be a forty thousand dollar campaign to raise money for our 2006 U.S. Tour. We didn't need a platform like Kickstarter to know that our fans loved to come along on the journey with us, from the recording of our albums to the embarkment of U.S. tours. From the very start of our story, our band incorporated our fans as friends, as family, and quite frankly as business partners. I mean no disrespect when I say we trained our fans from very early on in an exchange process. The "training" was not planned or intended, but we were broke. It was obvious. And people wanted to help. We were also passionate. It was obvious. And we inspired people to help. We said no to nothing. We played shows in bowling alleys and parking lots and floors inside malls. We quit day jobs and cashed in 401Ks. We showed up, night after night. Every gig was life or death. Albany, New York on a Friday to Charlotte, North Carolina on a Saturday. We did it happily. For the most part. We got to know every single person in every single room who bothered to listen to our music. And then, I will share our secret. We kept in touch! From day one we established a dynamic. We will live our dream. Please help us do it. ...I will share our secret. We kept in touch! My voice shook as I spoke to the clearly perplexed man on the phone from eBay, "I play in an indie rock band and we are going out on tour. Our fans are purchasing the tanks of gas to help fuel our way around the county. In exchange, we plan to send them photos of us pumping the gas, and depending on where we are on tour, we will send them indigenous gifts from the region. You know, if we're in Georgia we will probably include a peach magnet and from Idaho we will send a potato peeler. Get it?" I said, fearful our hard earned money would be 'null and voided' by the young eBay executive. 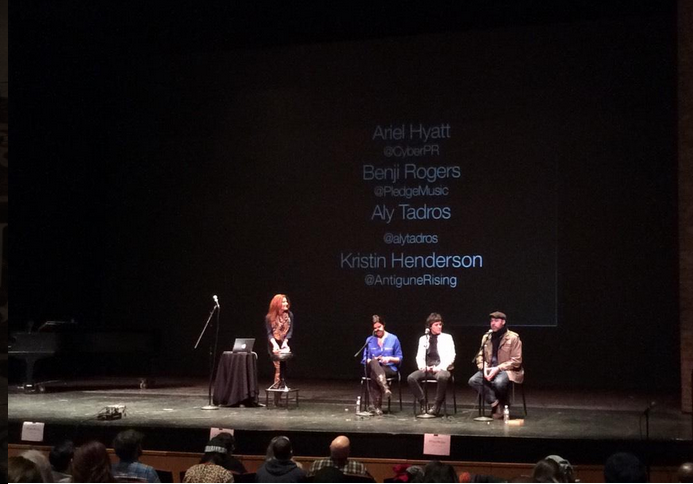 Yesterday, I was a member of a panel discussion on the topic of crowd funding. There I was, Kristen the drummer turned rhythm guitarist turned bassist, Kristen the bandmate, Kristen the songwriter, Kristen the expert on crowd funding? As it turns out, yes. Kristen, the expert on crowd funding. Want to know how to make money in the music industry? Just ask for it. 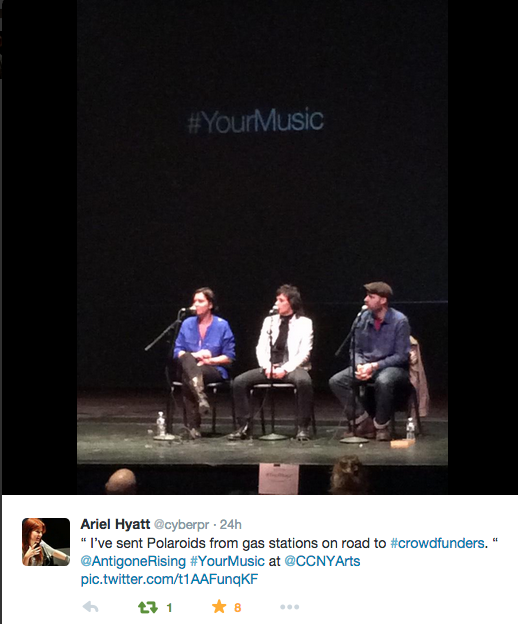 You don't need platforms like Kickstarter or Pledge Music or Indie GoGo, though Antigone Rising has used these sites from time to time with great success. You just need people who love what you do. And you need their email address. And that's it.